Racheli Baruch was stabbed in the stomach by an Eritrean patient on Monday. 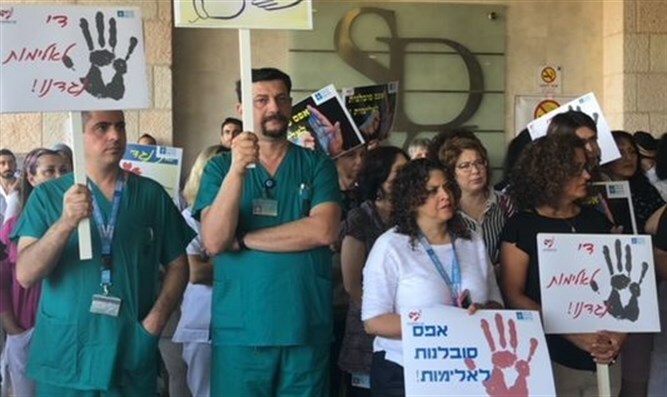 The condition of Racheli Baruch, the hospital nurse who was stabbed by an Eritrean patient on Monday, has worsened and is now defined as being serious. She underwent emergency surgery yesterday (Thursday) and is now under sedation and mechanical ventilation. Baruch, who is 60, was stabbed in the stomach by an Eritrean patient on Monday, at Shmuel Harofeh Hospital. The stabber, who is in his 30s, was remanded to six days' detention on Tuesday. According to a statement by Assaf Harofeh Hospital, where Baruch is being treated at the Intensive Care Unit, it seems that the knife wound was deeper than the doctors had thought, and that the nurse is suffering from an additional internal injury. On Wednesday, nurses countrywide held a strike to protest violence against medical teams. According to Israel Hayom, Esti Ayalon Kobu, Racheli's daughter, said at the hospital that the assailant had been hospitalized in the past and was simply upset because he wanted to be readmitted to the hospital.